Imagine a person with a photographic memory, astounding deduction skills and a thirst for solving crimes, living in London in 1881. Sound a bit like Sherlock Holmes? In Falls Patio Players opening season production, it is indeed Sherlock Holmes, at the center in solving a series of murders. Only this Sherlock is a woman, the central figure in “Miss Holmes,” a thoroughly smart, sophisticated, witty and absolutely delightful production directed by Diana Alioto. What gives this show a relevant layer is the way women were viewed at that time. While a man with similar remarkable skills would be highly respected, Miss Holmes’ (Lori Nappe) behavior is considered aberrant (she has a tendency to smack any man who violates her space) and thus she has been placed in mental institutions throughout her life. Her chauvinistic brother, Mycroft (Nicholas Marzinski), does not understand her remarkable abilities and is only too happy to send her back to the institution. He arranges for a woman, Dr. Dorothy Watson (Karen McKinney) – among the first female physicians in England – to visit his sister with the promise of a free room if she can keep his sister “out of trouble.” Though Sherlock has virtually no friends, the two hit it off. 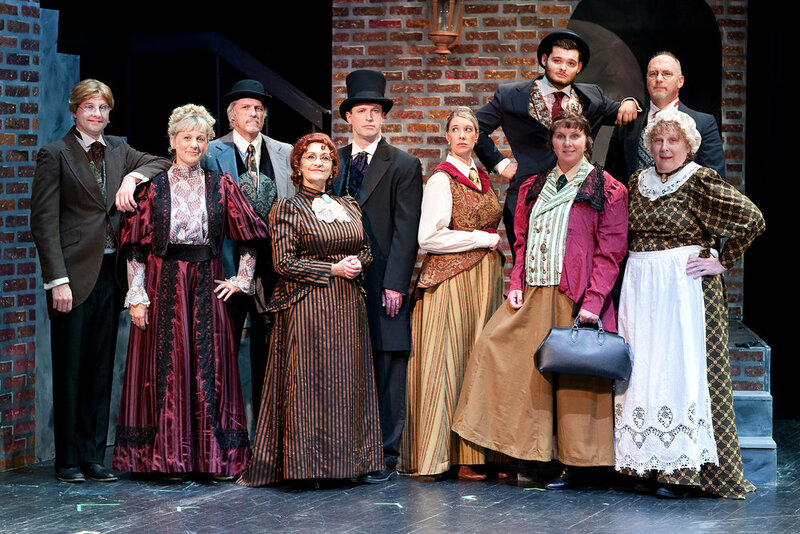 The cast of Falls Patio Players “Miss Holmes, from left, Justin Lehman, Kelly Simon, Bill HItt, Jennifer Sciuti, Nicholas Marzinski, Lori Nappe, Thomas Madrzak, Karen McKinney, Kurt Magoon and Gailmarie Haller. Later on, Watson describes the horror of the Surgeons’ Hall riot in Edinburgh – an actual event -- in which a group of females studying to be doctors was verbally assaulted and assailed with garbage as they were about to enter a building for an anatomy exam. These feminist messages are so subtly, deftly and humorously delivered that they never sound preachy. Under playwright Christopher M. Walsh’s dialog they creep out as naturally as the London fog. But that is but an appetizer of this delicious whodunit. The meat involves Lizzie Chapman, who has gotten several messages indicating she should fear her husband, Thomas (Thomas Madrzak), an unscrupulous Scotland Yard inspector and twice a widower. She comes to Miss Holmes for help and soon an excited Holmes and a reluctant Watson find themselves entangled in a messy series of murders. But the men in the show don’t think much of this duo. “This is no business for women to go mucking about,” says Lestrade, a Scotland Yard detective aware of Thomas’ sketchy past. Nappe and McKinney are an absolutely delightful Holmes-Watson duo. Nappe’s Holmes is haughty, acerbic, self-assured and fearless, often tossing caution to the wind. Nappe has so much fun with Holmes, ramrodding her way through danger with total delight. From the moment she raps the top of a carriage with the command to her driver, “On to Baker Street,” one can sense this is going to be something special. I especially enjoyed her scenes in the institution in which Holmes is sedated, flopping around like a rag doll. Nappe even picks up a violin for a few melodic measures. As Watson, McKinney is a wonderful complement – perfectly delivering her amazement at Holmes’ intelligence, her trepidation at Holmes’ recklessness and her attempts to reign in the super sleuth’s free spirit. The Holmes-Watson scenes are rich with clever dialog that Nappe and McKinney are so comfortable with, down to convincing British accents. The accent is a bit more uneven with the rest of the cast, who nonetheless surround Nappe and McKinney with fine performances. Kelly Simon, returning to the stage after a five-year hiatus, demonstrates her penchant for British drama which I remember was so effective in “And Then There Were None” some years ago. Near the end, Simon’s Lizzie confronts Holmes in a tense scene that Simon brings to a fever pitch – until Watson arrives with some comic relief. But this is not about slapstick or farce. The comedy executed by this cast is clever and organic, never overshadowing the suspense. Other fine performances include Bill Hitt’s Lestrade of Scotland Yard. Hitt has a good look and demeanor for the detective. Gailmarie Haller as Holmes’ maid adds a nice bit of comedy with her Cockney accent as she fusses about her work, commenting on her mistress’ unconventional lifestyle. All but Nappe and McKinney have multiple roles, including Kurt Magoon, Justin Lehman and Jennifer Sciuti, which they really handle well, especially Simon doing double duty as a maid. Roger Bochek has created a handsome, multi-faceted set that features upper spaces for the Chapman and Holmes residences and floor spaces that serve as a carriage, Scotland Yard, hospital rooms and a dark alley with minimal set pieces and movement. Bochek’s costumes also help place the show in the Victorian era, while some well-placed “fog” shrouds several scenes in a London mystery. Corrie Tritz has her hands full with many spaces to illuminate to enhance the suspense and mood. 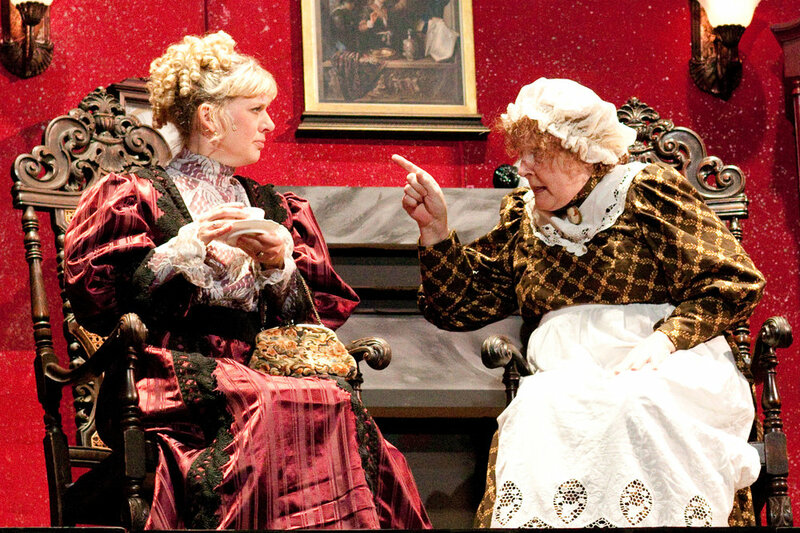 It is no mystery that “Miss Holmes” adds up to a most entertaining evening or afternoon at the theater.